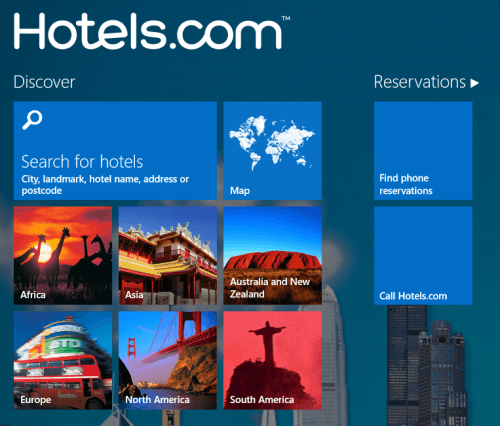 Hotels.com is a Windows 8 app to book hotels. It lets you find easy accommodation in more that 200 countries. If you are planning for a trip to some destination, then it can help you in booking a hotel-room. The service offers support for booking rooms in more than 150,000 hotels worldwide. 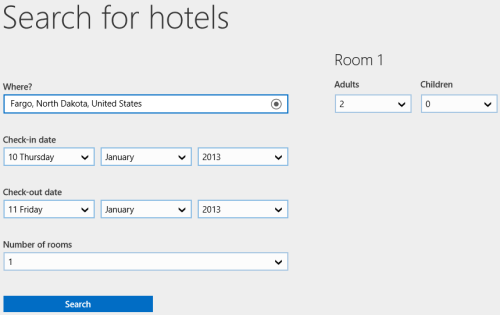 On launching this Windows 8 hotel booking app, you will be presented the following interface on the screen. Searching for hotels is very easy. On the top-left section of interface exists ‘Search for hotels’ button; click on it and the search interface will populate in the right section. Next, you require performing search by entering the name of place in the textbox at top right section of the interface. Soon after typing the initials in search box you will be presented the a short list of destinations matching with the string being entered by you. Next, you require selecting the appropriate one to continue. It will be a nice idea to check for name of City, State, and Country as many cities with duplicate name exist on this planet. Then, you will be presented a form to enter details like check-in-date, date to checkout, number of rooms, and people. Click on ‘Search’ button and within seconds the list of available hotels will be presented to you. Filtering and sorting can also be performed for which you require right clicking on blank section and select appropriate button from the bottom bar. Also, you can opt to view the map of region to find a best location for yourself. Also, check out our featured posts on Hotel Booking Apps, Travel Guide Apps, and Map Apps. 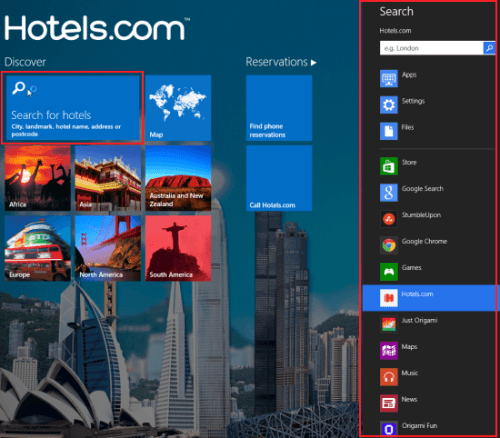 You can easily locate Hotels.com app in ‘Travel’ section of Windows Store. For quick and easy installation you require opening this link in supported browser such as Internet Explorer 10 or later. Next, click on ‘View in Windows Store’ button followed by a click on install button. * The App requires access to your Internet connection. 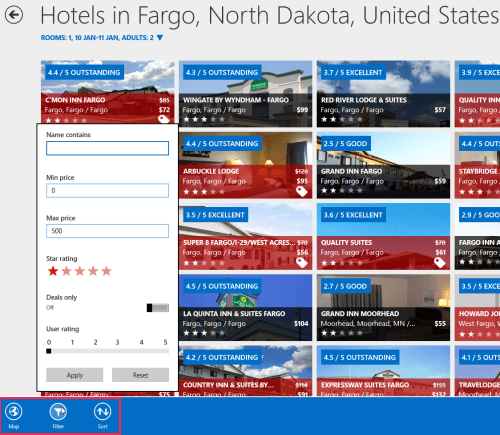 Hotels.com Windows 8 hotel booking app is quite good. You must consider giving it a try.